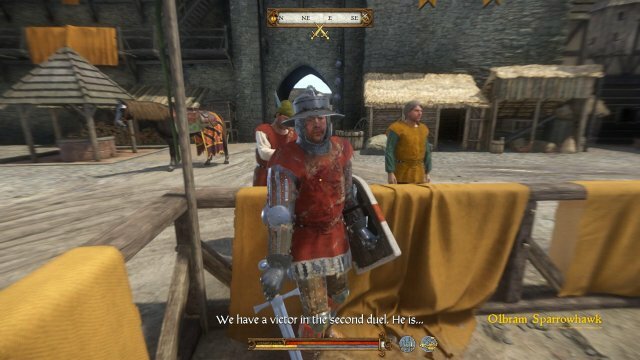 In this guide I'll show you a technique that can win you every single duel, no matter who you're fighting against - opponents on the Rattay Tourney, Captain Bernard, Runt, a high level Cuman or Bandit, a well armored Wayfarer or mercenary, it doesn't matter, they'll all fall on their knees! 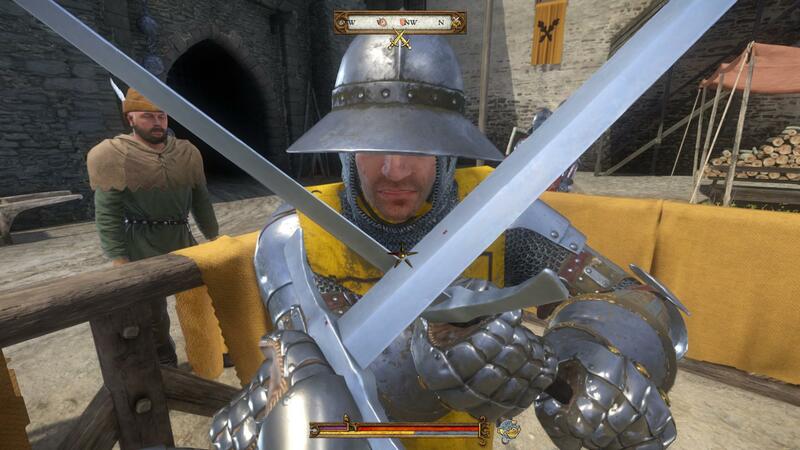 I tested this technique against all the oponents cited above, managed to beat Captain Bernard on a training duel with real swords without taking a single hit, won every fight of the Rattay Tourney and won all Leipa armour pieces with ease. If used correctly, you will win any fight without taking a single hit. The Secret is in Clinching! Clinching happens when you get too close with your opponent and cross swords. One of you comes out on top, hitting the other and creating an opening. The thing is, if you can consistently come out on top when clinching, you'll always have an opening to attack your opponent. To always win the clinching, I found out that you have to press F. All the attack buttons have a different action in clinching - and the most effective is the kick button F.
So, you go after your opponent, he might take some steps back but you will catch up and clinch, and when you lock your weapons quickly press F, win the clinch, walk towards him and attack. Against more skilled enemies the slash might be either too slow or he might defend, but you'll 99% of the time hit a stab (right click attack). Beware that when fighting a skilled opponent, if you try to combo or chain strikes after the first hit you'll most likely get Master Striked and might even lose a lot of HP in a combo if your stamina is low and you can't defend yourself. The safest route against those enemies is to test: Clinch, hit them and just at the moment your strike hits stab them again. If they defend, clinch and attack until their HP is halfway down or lower. When their HP gets to a certain point, their guard will open a lot after a sucessful hit and you can chain attacks. I'm currently using the perk Chain Strikes, in which each uninterrupted strike will do more damage than the last, and with this perk you can put down an enemy very quickly if you're careful enough not to get attacked/Master Striked. Always pay attention to your stamina! If you keep attacking until your stamina is very low, chances are your enemy will strike a combo and do a lot of damage! I always try to keep my stamina above the halfway mark, so even if the enemy counter attacks I can still defend myself, reset and start clinching again! I recorded a training fight with real swords against Captain Bernard to demonstrate the technique. I apologize for the freezes but this game is pretty performance-heavy! Note how I'm going after him, going after the clinch, and at the moment we cross swords I spam F.
Then, it's just a matter of getting a bit closer and slashing him. There's a moment when I wasn't careful and slashed thin air, and that's the opening he used against me. 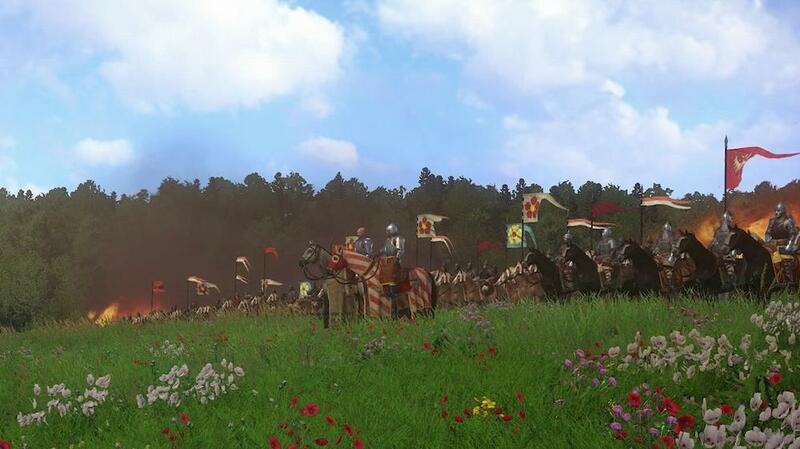 In a combat scenario in an open field this technique might take a little longer, because you won't have the fences behind your enemy to constrict his movement. That's when you have to be more patient. In this video I recorded my way through the tourney. Again, sorry for the freezes and the echoed sound - I don't really know the cause for that. Here we can see that it doesn't really matter which weapon you use, if you just keep on going the opponent doesn't stand a chance. Although the technique works with any weapon, they will all have their advantages. The longsword will have a greater range to slash, so you can attack with less leg movement, the warhammer will have a very high stab damage, the shortsword has quick attack with high slash damage. Just go to Captain Bernard and try them out to see which weapon you like best! I personally love using the Razor shortsword without shield, but I also like to use the longsword from time to time. Note that there were times where I was either careless with the timing of my attacks or with my stamina bar. Those were the moments I got hit. You also have to be careful when approaching your opponent to clinch. He will keep walking backwards to keep a distance from you, and he might attack! Keep a close watch to his weapon so you can defend or even master strike him. The best case scenario is to corner your opponent and keep attacking, although that isn't always possible outside of arena matches. I'd like to say here the same thing that's written on one of the loading screen texts: No one is born a master! You have to put in some time to train with Captain Bernard, and learn everything he has to teach you, specially Master Strikes. When you know how to perform a Master Strike, you'll have a chance to defend an opponent's attack, counter it and create an opening. This is very important, because when you're going after the clinch there's a chance the opponent will strike you in the meantime. If you pay attention to his weapon you can hit the Master Strike, hit him and close the gap to clinch. When Henry is lower level you won't win every single clinch. But by spamming F you have a pretty high chance, and even if you keep on getting hit it's still a valid technique because the clinching damage you take is insignificant. Plus, your opponent rarely uses a clinch opening to attack you specially if you walk away to reset. It's also important to get the perks Chain Strikes under Warfare and the Clinch Master under Strenght. They'll help you out a lot in fights! This technique is still valid in a fight with multiple enemies, but you have to be extra careful. If you're fighting low level bandits just keep your stamina high to always have a chance of defense and keep moving so you won't get hit on your back. Even against these low level bandits, if they gang up on you from behind you can quickly die, so beware and keep them on your line of sight! 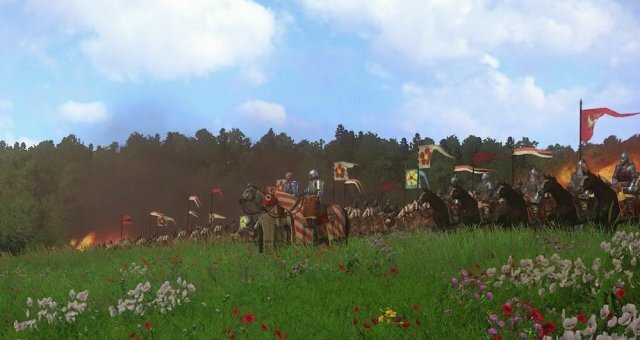 Against higher level bandits or cumans you also have to always keep them on your line of sight, but this time you can clinch to create distance between the opponents. Clinch on one of them and use the few seconds he's unable to attack to go after the other opponent. This gets trickier and more dangerous the more simultaneous opponents you face and the higher level they are. Drink a Saviour Schnapps and go to a cuman camp to train it!